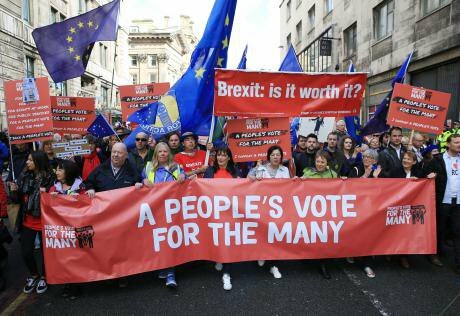 Image: People's Vote march at 2018 Labour Party conference. Credit: Peter Byrne/PA Images, all rights reserved. When thinking about Brexit and Europe, we should remember the words of Hans Magnus Enzensberger: short term hopes are futile - long term resignation is suicidal. Put in place a domestic reform agenda which speaks to the causes of the explosive Brexit vote. Let’s start by being clear: there is no good society (socialism) in one country as some on the left naively hope, without capitalism being tamed through democracy and regulation at a regional (European) and global level. The only way to achieve a good society is through democratic participation of citizens at every level in which institutions impact on their lives. From this perspective, we can start to build an argument that could start to reunite our polarised country and heal the wounds that were revealed by the Brexit vote. The Brexit vote, like it or not, was a big democratic revolution. The turnout was enormous compared to general elections and over three million of our fellow citizens voted who never do. More than 17 million people voted for the UK to leave the EU. Both sides can make a case for what was fair and what wasn’t: the £350m bus figures versus predictions of a recession and huge job losses. Stupidly, all agreed on the nature and terms of the referendum. The government was clear in its intention to interpret the referendum result as a binding vote and sent letters to every household saying as much. If Britain voted to Leave, then – it was commonly accepted though not expected – leave we would. "But poor people who voted for Brexit were not wrong, in that it was probably the best opportunity they would ever have to give the establishment a proper kicking, for ignoring them, for forgetting they exist. During most of the previous thirty-odd years, Britain and most of the rich West had been run on a deceitful prospectus. Labour and Tories had argued, and even for the most part believed, that they were governing for the whole nation. But that was tosh. They were governing for themselves and for those who work in the City and the service sector in London and the South-East. They were governing for property owners. They were governing for a highly skilled, internationally mobile elite of corporate executives, bankers and entrepreneurs. This is not revolutionary rhetoric, it is observable fact, which cannot be ignored by left or right." Dominic Grieve, a politician who I usually have huge regard for, recently asked whether we should “accept Brexit cannot be implemented and think again about what we are doing”. Let me be clear, I didn’t want the UK to leave the EU but it can’t be akin to Hotel California – somewhere you can check out from, but that you can never leave. Grieve simply highlights the democratic deficit of an organisation that feels itself to be beyond democracy. It has echoes of Tony Blair’s ‘sink or swim’ speech to the Labour conference in 2005 when he (in)famously said: “I hear people say we have to stop and debate globalisation. You might as well debate whether autumn should follow summer.” Is it any wonder the people voted to stop it when they had the chance? This autumn marks the tenth anniversary of a publication called Europe - the Good Society. It was authored by the now leader of the German SPD, Andrea Nahles, and UK Labour MP Jon Cruddas. It set out the case for a social and democratic Europe in the 21st century and sparked a debate across the continent. The only place where it didn’t really ignite debate was here in the UK – because most progressives have had little or no interest in what a progressive Europe looks like. To the Blairites, Europe was a place to be mildly ridiculed because of its failure to be New Labour enough, to see it only as a space for market-based reforms, while working time directives and the rest were all rejected or wriggled around. The more traditional left, who opposed the UK entering the European Community in 1975, still held out for socialism in one country. Compass ploughed a deep furrow, publishing work and promoting networks across the continent about what a good Europe could look like. With the help of the Friedrich Ebert Stiftung (FES), and Social Europe, from Berlin to Stockholm, Budapest, Rome, Lisbon and beyond, the debate flourished. But it continued to fall on deaf ears here. Europe was either about free markets or it was a place to leave, with more progressive elements in the unions, the Greens and the Labour left squeezed. Neal Lawson is Chair of Compass. He would like to thank Francesca Klug and Anthony Barnett in particular for comments on an earlier draft.